does anyone tried to add their personal nick to their contact list? i got new nick and im trying to add but it cannot be. as far as i recall, adding personal contact to your own contact was able to do. is this included for the new updated system? i guess there could be another problem or net problem. goldy bro is your golden_soul nick is added to your golden_soul nick too. try to delete your nick from your personal contact then try to add again. 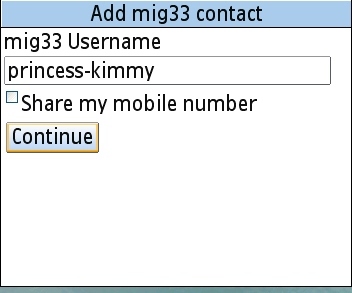 princess-kimmy nick added to personal contact which is princess-kimmy account. now i delete princess-kimmy nick from personal contact. now, i adding my own nick to my personal account. see this last snap shot it says my own nick cannot be added to my contact list. hope you guys got what i mean. 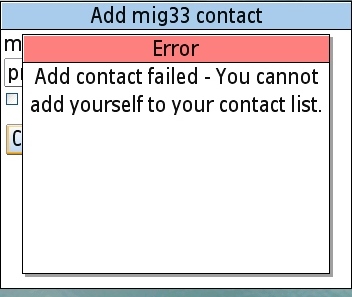 Subsequently after the past updates, the ability to invite ourselves as contact has been disabled. We can no longer add ourselves as contact anymore, motion behind behind that update remains vivid to my understanding. The ability of having yourself as contact was very useful especially in cases whereby someone else logs in on your username, and if you were on offline presence you would know so by seeing the contact coming online. Now that useful ability is no more. exactly konvict bro . hope they will realize how important to add our personal contact to our personal account. After the updates we cnt add our own id and you are right konvict its very useful for us.sometimes i forgot whats my presence status i need to ask smeone to tell me. sometimes i forgot whats my presence status i need to ask smeone to tell me. precisely butterfly sis, nevertheless they always say, behind every motion there's always a motive. In this case, I would really love to know it. i didn't wish to reply in this topic because i thought anyone will give answer what am going to give now. Above the email option, you'll see your own id with a icon as well as your update message too. Just look at that icon and it shows what your status!! 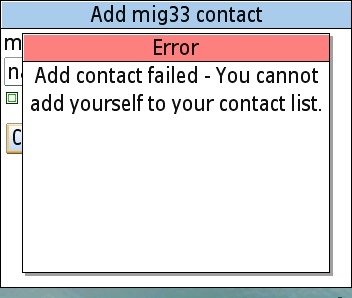 Then why we still need to add our own contact? Net trap, that would mean we have to always use version 4, isn't it, and that is something that is not possible to everyone. As some users prefer the previous versions. exactly konvict..and as we all know mig4 is not yet completely bugs free..i still prefer the old version..
maybe its bcz the new update bout contact system..
so how can we add personal contact again like before?? now new mig version 4.02 also available friends. . Why don't you check it out?